Distortion and overdriving is being reported by users of MXL and Samson USB microphones who have switched to Windows 7 from XP. The problem exists in the 32 bit and 64 bit versions. It also affects USB turntables and other USB audio devices. Typically the microphone volume has to be reduced in the windows audio mixer to practically zero to prevent overdriving and distortion. Even at these levels there can be occasional buzzing or other distortion. If the microphone (like the MXL ones) has a built in attenuator then setting this to low output helps a bit, but the audio quality is compromised because the full dynamic range of the microphone is affected. The same problem may also affect USB audio interfaces and mixers. See my update at the end of this article for a possible solution. 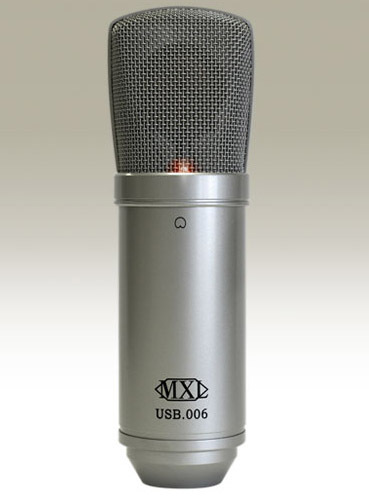 I have used an MXL USB.006 large diaphragm USB microphone for several years on both WIndows XP and Ubuntu Linux, recording into Audacity with no problems, but it won’t work properly with Windows 7. The bad news is that there is no proper fix for this. It is not caused by Audacity or the operating system itself. The problem is the generic USB audio driver for Windows 7 seeing all inputs as low level microphone inputs rather than high level line inputs (which is how these devices were designed and how they worked under Windows XP). This happened because Windows 7 is optimised for teleconferencing, VOIP and using a headset. Until someone designs a USB audio driver for Windows 7 which corrects this, then there is no real solution. Some users are reporting fixes related to bit rate settings or using the speech recognition microphone set up wizard in Windows. I have tried these and they sometimes seem to work, but that seems to just be coincidence as the intermittent buzzing comes back. I have tried Windows direct sound and MME and both have the same problem. Its all drive level related. Keep the gain turned down, keep the attenuator padding turned on, accept the poorer audio quality, and hope there is no distortion midway through your recording. Get a separate PC running Windows XP or Linux for audio recording purposes. Buy a standard XLR dynamic microphone and a seperate mixer which can provide ghost power and plug into the soundcard line input, NOT a USB socket. All of these are an extra expense and quite disappointing, but I may just have to bite the bullet and replace my microphone and add a mixer. Well, I have found a solution to the distorted buzzing sound on recordings. I increased the "audio to buffer" setting in the Recording Preferences in Audacity from 200ms to 300ms. This has stopped the distortion. Recording levels are still too high, but with the attenuator turned on and the mic gain set at 0.1 it does work. Can life have meaning without God? Professor John Searl - or is it?